From the rich archive of SYSTEM 7’s celebrated 12” singles from the period 1992-2000. These tracks have never been available digitally before and some were only previously available on vinyl. 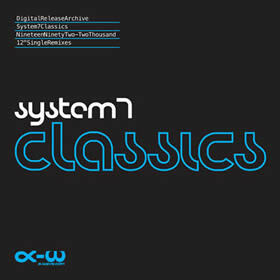 Featuring techno & house remixes by Carl Craig, Marshall Jefferson, Carl Cox, David Holmes, The Advent, Tony Thorpe and System 7 themselves, and drum & bass remixes by Doc Scott and Jacob’s Optical Stairway (aka. 4 Hero). The original tracks include collaborations with Laurent Garnier, Derrick May, and Dr. Alex Paterson (of The Orb).